Medtechs increasingly need to take customer-level profitability into consideration when making sales resourcing decisions. Meanwhile, providers will likely continue to consolidate, offering medtechs the opportunity to benefit from vendor rationalization and product standardization initiatives. To adapt to these changes, medtechs are prioritizing consultative selling with specialist support at the account level. Medtechs also must be able to provide messaging that caters to value-oriented decision-makers, especially in strategic accounts. Answering several key questions can help medtechs determine where their commercial models may need further adjustments. Adapting commercial models to the changing U.S. customer landscape continues to be a key priority for medtechs. Ongoing provider consolidation, increased emphasis on economic value and a more centralized, administrator-oriented approach to purchasing are among the elements impacting the legacy commercial models of medtechs. With sales increasingly coming from fewer accounts, it is imperative that medtechs review and, where necessary, revamp commercial strategies to ensure sales coverage and capabilities address customers’ changing needs. Medtechs’ ability to tailor their approaches to different customer segments and to clearly demonstrate their value using specific tools and/or diagnostic approaches will go a long way toward achieving prosperity. In this Executive Insights, L.E.K. 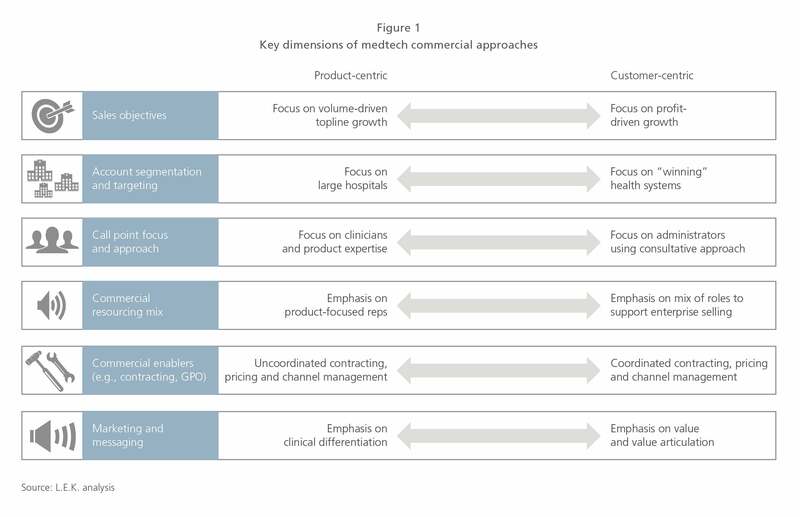 Consulting offers an assessment of how medtech commercial approaches are being reshaped by changing customer preferences on several key fronts. Across these dimensions is a noteworthy shift from product-centric to customer-centric commercialization efforts. Customer profitability has become an increasingly important consideration in medtech commercial models. In the past, medtechs had limited need to understand differences in the profitability of selling to and servicing their customers. However, with customer price pressures on the rise and growing provider expectations for expanded services, medtechs increasingly need to consider customer-level profitability when making sales resourcing decisions. This includes adjusting the level and type of account coverage as well as sales incentives, which historically focused on volume-driven revenue growth and were often not aligned with (or were even at odds with) customer-level profitability. Consolidation within the provider space is expected to continue at its current pace: According to our research, within 10 years, at least three-quarters of total U.S. healthcare spend will be controlled by a select group of approximately 200 health systems, with the top 100 systems representing more than 60% of spending. Along the way, acute-care expenditures in particular will become the domain of a smaller subset of the larger health systems, and this will lead to “chunkier” account wins and losses. While this certainly presents challenges, it also underscores the opportunity for leading medtechs to benefit from vendor rationalization and product standardization initiatives. Determining which providers stand the best chance of “winning” in the years ahead will be imperative for medtechs wanting to succeed in the U.S. market. In addition, tailoring differential offerings (e.g., expanded solutions versus traditional product sales) to different segments of customers (i.e., those looking for deep partnerships versus those simply looking for low-priced products) is becoming more critical in order to align with customers’ needs. Similarly, more-strategic segmentation of account purchasing patterns, such as the degree of centralized decision-making (e.g., at the department, facility or system level), is needed to determine the appropriate targeting and resource deployment models. Medtechs are also updating their commercial engagement models and sales force capabilities to better align with the changing faces and roles of customer call points. The emergence of large integrated delivery networks, or IDNs, has increasingly shifted decision-making from clinician to administrator call points and value analysis committees (VACs). To adapt, medtech sales teams are prioritizing strategic account management roles with consultative selling targeted at senior executives at hospitals. To support the strategic account function, medtechs are also rolling out a deeper set of specialist roles (e.g., clinical specialists, IT implementation specialists, health economics and outcomes research experts) and, in some cases, developing new roles to advance broader solution offerings (e.g., consulting and change management capabilities, “hospital solutions” groups across business units). Overall, there is a rebalancing from many “product reps” to more “account reps” that are supported by more-specialized roles. Additionally, medtechs are investing in commercial enabling competencies, focusing particularly on areas such as health economics and outcomes research (HEOR), contracting, pricing, channel management and customer/technical service. Leading medtechs are streamlining contracting and pricing to achieve more-standardized processes, quicker response times and more-coordinated approaches to larger, more-complex sales deals. These efforts are also expected to aid in the development and subsequent support of potential gain-sharing models. Channel management (e.g., strategically engaging with distributors) has also become a more prominent part of direct commercial activity. This includes ensuring consistent commercial-team support when managing IDN-based direct distribution, in addition to leveraging the channel to meet growing demand among IDNs for integrated/standardized acute and nonacute care delivery. National account teams are similarly reconsidering their group purchasing organization (GPO) strategies in response to the decreasing value that large IDNs perceive from national GPOs. With value-oriented stakeholders having a greater impact on the decision-making process, medtechs must be able to provide messaging that caters to these call points, especially at the strategic account management level. Sales teams must clearly articulate and quantify value with concrete case examples and economic tools (e.g., cost calculators) that are designed for specific accounts and/or types of accounts. Sales collateral, especially for the more senior administrator call points, must increasingly be tailored to specific customers and reflect local market dynamics (e.g., hospital share position, benchmarking versus competitors). For example, medtechs are developing or acquiring new tools and services that complement product sales to help solve hospitals’ key problems, whether that’s helping transition post-acute patients, avoiding adverse events or managing a specific department more efficiently. This enhances sales team credibility and relevance and enables higher-level, partner-oriented discussions. Providers are changing how they procure products and how they choose their suppliers. That said, different segments are emerging, each with a unique set of behavioral needs and purchasing approaches. Accordingly, medtechs must hone their commercial-facing capabilities to ensure better alignment with the needs of each segment, while focusing in particular on “winning” systems that are likely to lead the way through further mergers and acquisitions (M&As) in the years ahead. How well are the relative priorities, needs and purchasing approaches of the top 100-200 accounts understood? Given differences across provider accounts in terms of needs and purchasing approaches, how well aligned is the commercial organization with different segments? Are limited commercial resources focused on the “right” accounts? How well are facility-level product penetration and customer-level profitability understood for each of these accounts? Should changes be made? To what extent is the right data being gathered from customers to build insights into product usage and outcomes?